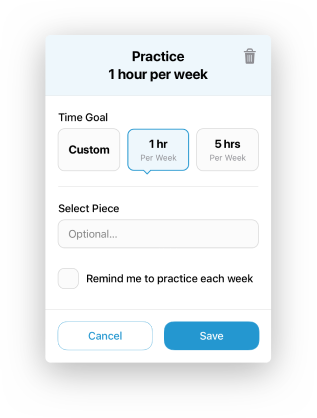 Use the app every time you practice to see how much progress you've made each week, month, or year. You can also add individual pieces and measure how long some pieces take to learn compared to others. By using the app to practice, you are joining many other music students, enabling discussion around a piece of music. Get stuck and need help? Post a question or help others who are learning with you. The practice app connects to Musopen.org's music library, which means a wealth of new music is available if you want something new to play. Browse for new music to learn in the music library tab, and explore music by composer, difficulty, or see what's popular. Stay motivated by setting goals against the time you spend practicing. Set a goal across all music each week or month, or set individual goals on a specific piece of music.